Admin Control Sections : Each of our systems comes with our "Lead Store" where users can instantly fill their back office with real-time leads. These leads are redirected to the user's tour page and autoresponders are automatically triggered and all data is added to the user's contact manger for a truly seamless "plug n play" marketing system. Resources and Training Articles- These are articles displayed under the Dashboard as uploaded by admin. System Training- These are articles displayed under the Dashboard as uploaded by admin. Traffic Sources - These are articles displayed under the Dashboard as uploaded by admin. Marketing Videos - These are articles displayed under the Dashboard as uploaded by admin. 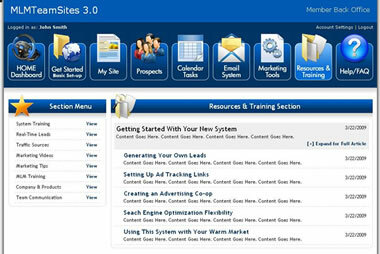 Marketing Tips - These are articles displayed under the Dashboard as uploaded by admin. MLM Training - These are articles displayed under the Dashboard as uploaded by admin. Company & Products - These are articles displayed under the Dashboard as uploaded by admin. Basic Training - These are articles displayed under the Dashboard as uploaded by admin. Team Training - These are articles displayed under the Dashboard as uploaded by admin. Copyright 2006-2013. TenBrink International. All Rights Reserved.